As we know, Apple iPad is giving a great shock to all the media player lovers with all its cool look and flexible features. Most iPad users are eager and happy to play as many videos as possible on this smart device, but they are upset to find out it does not support some formats like FLV. Can there be a tool to convert FLV to iPad and allow us to play FLV video on iPad? FLV (full name as Flash Video) is a container file format originally developed by Macromedia. With its smaller file size to store large- size videos, till now, you can always see FLV videos on blog website and video sharing websites like YouTube, Hulu, Google Video, Yahoo! Video, metacafe and so on. It is so popular that when you want to play a video on iPad, you will always find that it is in FLV, especially when you download a video from the sites above and watch it offline. However, iPad is known to support only few formats of M4V, MP4, MOV and a small part of AVI. That is to say, it is not practicable to play FLV video on iPad offline even though you have a video downloaded from YouTube. In order to play FLV on iPad, what you need is just a versatile FLV converter to get everything done. I have personally tried to convert FLV to iPad on my Mac computer with some ipad video converters and compared them in aspects like the number of supported formats, ease of use, output quality etc. 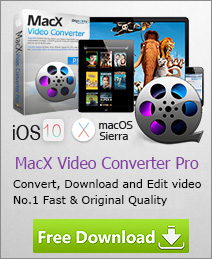 MacX Video Converter Pro is a good choice because it fulfills all your needs completely and perfectly. World's fastest iPad FLV video converter to convert FLV videos to iPad or download online FLV clips to iPad Pro/mini 4/Air 2 etc with the fatest speed and no quality loss. First, it is designed to not only transcode FLV video and make FLV playable on iPad but also convert any HD and SD videos, including HEVC, MKV, M2TS/MTS, AVCHD, H.264/MPEG-4 AVC, MPEG-2 HD, MPEG-4 TS HD, WMV, MP4, RM, RMVB, WebM etc to iPad supported formats H.264, MPEG-4, MOV within a few clicks. Second, it allows users to convert online FLV videos to iPad (iPad Pro/Air 2/mini 4 etc) with its advanced downloading feature from more than 300+ sites like YouTube, Vimeo, Vevo, Dailymotion etd. You are free to play any online FLV videos on iPad. Last, it takes advantage of Intel Sync Quick Video/Nvidia/AMD GPU HW acceleration technology to provide the world's fastest speed to decode FLV files to iPad!! After download the latest version of iPad flv video converter, install and run it. Click the "Add File" button to import FLV video files that you want to watch on your iPad. Select the output video you desire. To put flv to iPad, you can either choose to convert FLV to iPad supported formats like MP4, MOV, or select the exact iPad device, including the latest iPad Pro, iPad mini 4/Air 2 etc as you need. After finish the above steps, click the "RUN" button to start the FLV to iPad conversion, you could view the conversion progress and are able to cancel the converting process at anytime. 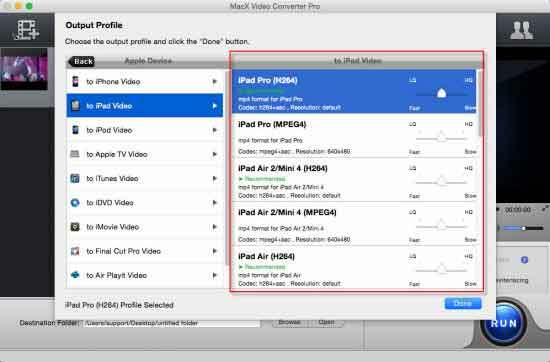 MacX Video Converter Pro is the best video to iPad 3/iPhone 4S/Android converter to convert video to iPad 3, iPhone 4S, Android video, like AVI, FLV, WMV, MKV, etc. Do you want to play FLV on iPad Mini with ease? This tutorial gives you tips and tricks to convert FLV video to iPad Mini on Mac, so that you can enjoy your videos on this new iPad Mini wherever you are.